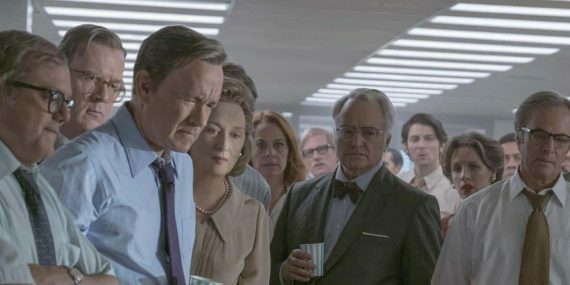 Steven Spielberg’s historical drama The Post opens with the unfortunate double whammy of a cliché and an anachronism. A caption appears over images of the Vietnam war informing us that it is 1966 yet the soundtrack blares Creedence Clearwater Revival’s ‘Green River’, a song not released until 1969. IMDB lists this in their ‘Goofs’ section but it is more likely just lazy film-making. Since the song is not depicted as being emitted by a radio, Spielberg obviously prized the atmosphere the track creates over whether it was era-appropriate. But therein lies the greater crime, since any film fan knows that what the use of the track evokes above anything else is the spectre of every other damn jungle sequence you’ve seen in a movie since the early 70s. Creedence Clearwater Revival have soundtracked everything from Vietnam scenes in Forrest Gump to jungle monster attacks in Kong: Skull Island and their appearance here does less to to situate The Post in its era than to link it to farcical images of a pumped-up Ben Stiller blundering his way through Tropic Thunder. It is a surprising and disheartening introduction given that one of Spielberg’s strengths, even in his weaker films, is to make audiences immediately feel as if they are in a safe pair of experienced directorial hands. In this case, I was immediately put on edge by a hacky miscalculation. And I love Creedence Clearwater Revival! Fortunately, the stench from this false start does not permeate the entire film and those safe directorial hands are quickly used to discretely waft away any lingering misgivings. What Spielberg does with the material here is nothing new or edgy but his knack for combining the comforting experience of an audience getting exactly what they expected with a strongly realised dramatic tension that offsets these expectations by keeping them interested throughout. What is most fascinating about The Post is how it makes a comparatively interior-bound story effortlessly cinematic in an era when TV is at the highest level of quality audiences have ever experienced. Why, one may ask, should Spielberg bother with this subject matter when it could so easily be made more than adequately for the small screen? And then we see those towering printing presses. With a technical mastery that taps into the same awe-inspiring visual skill that previously gave us dinosaurs and spaceships, Spielberg turns the presses into a giant toy before our eyes, their operatives big kids crouched round a Scalextric on Christmas morning. These moments are the reason we still go to the cinema. 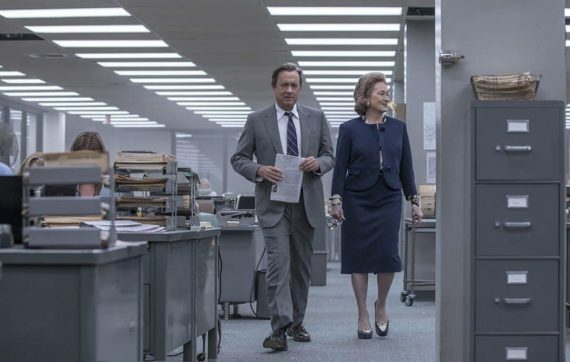 In many ways, The Post seems to deliberately play on the tensions between classic cinema and modern, upscale television productions. Spielberg populates his supporting cast with faces most recognisable from popular television shows: Breaking Bad’s Bob Odenkirk, Community’s Alison Brie, The West Wing’s Bradley Whitford, Fargo’s Jesse Plemmons, Silicon Valley’s Zach Woods, Arrested Development’s David Cross. It’s an impressive group but The Post’s publicity campaign made a point of foregrounding those three big names: Streep, Hanks, Spielberg. No first names required. 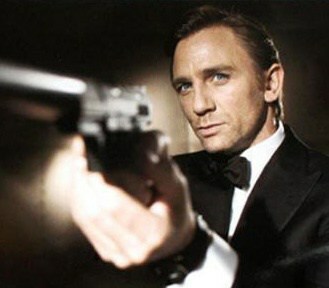 Again, these are the reasons we still go to the cinema. The powerhouse star performances of Streep and Hanks are markedly different to the smaller realist sketches of their co-stars and this creates a wonderful tension that combines melodrama with realism. The finer details are in the body of the text but our eyes instinctively get repeatedly drawn back to the bold print of the headlines. 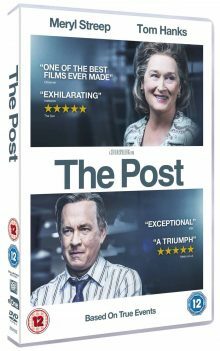 Among its smattering of cinematic grandeur, The Post tells its tale of The Washington Post’s attempts to expose a 30 year government cover-up regarding the Vietnam war with a thrillingly televisual intimacy. When Spielberg became involved in the project, he recognised that it was a subject with great relevance to the current political climate and decided that it couldn’t wait the length of a normal production process to reach the screen. Therefore, he dived headlong into making the film while still in post-production on his sci-fi blockbuster Ready Player One. From principal photography to final cut, The Post took less than six months and this sense of urgency shows up in the energy the film expertly captures. Given more time, The Post could, and probably would, have been pumped up with more pomposity and self-congratulatory sentiment. There is undoubtedly an element of this in the film Spielberg actually made but, in all honesty, I would have been disappointed if it hadn’t been in there. The rousing sense of real achievement and historical importance is captured in a heart-warming but comparatively low-key manner. High-fiving, hugging and the huge orchestral swells that usually accompany moments of victory are forsaken, with the most sentimental concession being the momentarily tear-rimmed eyes of a newsroom employee. Spielberg’s decision to rush The Post through production has helped the film in every sense, allowing it to emerge in the midst of the Trump administration to which its script slyly alludes while also imbuing it with the sort of dramatic urgency and rough-edged energy that was missing from some of the director’s previous big-issue pictures like Amistad. Despite its Oscar nominations and critical acclaim however, it is likely The Post will ultimately go down as a minor work in the Spielberg canon, its hurried production and release perhaps working against its long-term reputation. Its superficial similarities to other more emphatically acclaimed newspaper dramas like All the President’s Men and Spotlight (with whom it shares a screenwriter) may also cause its glow to dim somewhat with retrospect. But for those who saw it at the time in political history for which it was intended, The Post will doubtless retain a greater power than future generations may attribute it with possessing and, regardless of its contemporary impact, it will also make a thrilling and comfortingly solid evening’s entertainment for anyone with even a passing interest in its subject matter. If the film opens with an unfortunate stumble, it more than atones for this in its subsequent achievements not only in highlighting important issues of the past and present but, even more presciently, in reminding us that, no matter how good television gets, there is still a reason we go to the cinema. Streep. Hanks. Spielberg.